I met co-owner Melissa Vigue more than a year ago while she was styling the hair of a bride for a wedding I was photographing (picture at left). I loved her sweetness immediately, her great sense of style (see the earlier post about the bangs she recently cut for me!) and her climb-to-success story. After agreeing that both of our business styles are very similar, it only made sense to start seeing Melissa as a client at the salon. As it turns out, she grew up one street over from my house, and now lives less than a mile from me, too! Bei Capelli has been nominated for the Global Salon Business Award, a hefty honor that requires a seemingly college-like application process including essays and headshots. Melissa asked me to take the photos for their application. And so while this isn't necessarily a vendor tour, per say, mimicking a bride's visit to the salon, it still gives you an idea of the space and just how many stylists Bei Capelli employs. I hope to get back soon to take a more photojournalistic tour of the space for you to see just how fun- and relaxing- it is! This is the team- owners, stylists and receptionists. It's a big staff! I also took individual headshots of everyone, but that's not too terribly exciting to see. A little collage inside the salon showing the cutting floor, the "color cafe," the shop and the exterior. I love how the hairdryers hang from the ceiling! 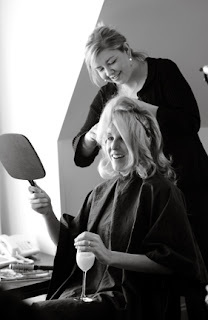 If you're looking for a stylist for your wedding day, Melissa and her team are available to travel to your preparation location or you can visit the salon. I can't recommend these folks more, both from personal and professional experience! Good luck in the competition, Melissa!